You are in a ceramics store in a tourist town. 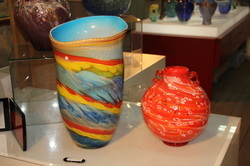 There are only a few people looking at the expensive, intricately coloured glass vases. Despite the signs warning customers not to touch the displays for fear of breakage, one woman is picking up all the vases, looking at the maker’s marks on the bottom of each one, twirling them around to check for uniformity of colour and design and then replacing them on the shelf. The storekeeper does not seem to take an interest. Just then two local women enter the shop and greet the store owner. They are speaking in the local dialect. They slowly move toward you, causing you to move a bit closer to the woman looking and handling the vases. Then out of nowhere, the first local woman trips into the second local woman who bumps into you, which in true domino fashion, causes you to lose your balance and you bump into the woman handling the vases. The woman lets out a small scream just as the vase she is inspecting, crashes to the ground. All eyes are on you. The vase inspector starts yelling that you bumped into her. The shop keeper starts yelling that you pushed the other customer. The two local women start yelling that they saw it all and it was YOUR fault. You don’t speak the language. You are upset and confused but you know you were pushed. You want to get out of the store but now the women are blocking the way, and yelling faster and louder. The store owner writes down the cost of the broken vase, which happens to have been the most expensive in the store at nearly $1500.00 US dollars. You decide to pay your way out of the scenario and discover that you only have $300.00 cash in your wallet. The store owner grabs it, opens the front door and all four women yell at you as you quickly leave the area. What you will not know is that the cheap vase is replaced on the shelf fairly quickly with another; the woman divvy up the money and share a laugh. You are devastated but relieved that you got out of the store and it ‘only’ cost you $300.00. This is the famous “Bump” routine and you are the 4th victim today that fell for it. The Bump also works well on the road in your rented car when the car behind, bumps into your car with enough force to cause you to just ‘kiss’ the bumper of the car in front. The ‘kiss’ is tantamount to a major collision write-off for the other driver and he quickly gathers all his neighbourhood friends around to impress on you the amount of damage you caused. (Usually there a dent in the car from many previous ‘bumps’, but apparently you are the one to blame) Again, the solution is to pay on the spot—which you do just to get out of this mess. I wrote about Travel Scams in a previous article and true to an education that included both the Encyclopedia Britannica Junior and MAD magazine, the latter of which had a great effect on my future writing and thinking processes, it is only fitting to call this Scam Sequel, “Son of Scam”. The Bump is a performed like a one-act play with each person in the scam well rehearsed in the role that they take. Other coordinated group scams include the famous “Cardboard Children of Rome”. In this scam, one or a few tourists are wandering the streets with a map, usually close to a famous attraction. When we saw this one back in 1988 we were on a bus outside the Colosseum in Rome and we witnessed three separate attacks by the Cardboard Children. They consist of a group of roughly 10 children all appearing to be between 8 and 12 years old. All are wearing nice new running shoes and all are holding a piece of cardboard, roughly the same size as you find when you buy a man’s shirt. The kids are holding the cardboard in front of them and calling out to you for money and candy and they quickly surround you shouting out their demands. At the same time, they are pressing the cardboard against you. You have no idea what’s going on, so after a few seconds you scream for them to get away and all of a sudden they run off in 10 different directions (hence the running shoes). You congratulate yourself that you got rid of them. And then, a few seconds later when you check for your wallet or camera, you engage in one of those spastic panic body pats as search for your valuables. What happened? The kids use the cardboard to distract but also, when they press it flat against your body, they are de-sensitizing you so you don’t notice all the little hands exploring your pockets or purse and removing anything of value. You feel nothing. The shouting of the kids helps in the process as it distracts and confuses you. This scene is repeated over and over again with tourists of all ages, travelling solo or in groups of up to four adults. It works every time. In the first article I mentioned a few distraction scams, but did not talk about “Jet Lag” which is a scam artist’s best friend. When you arrive at a far-flung destination where you have travelled overnight and switched several time zones, your thinking may be dulled and your concentration may not be as acute as it should be. You exit the immigration desk and find the currency exchange office. As you are in the airport you have been trained to believe that you are safe and scam free. Not so. The woman counts out the local currency for you. She even pretends to make a mistake and adds another bill to the pile and counts again, and then counts the money directly into the tray for you to retrieve. Later that day when one of your bills is refused, you learn that many of the bills are counterfeit. Everyone in the country knows about counterfeit bills and that is why they hold every bill up to the light to ensure they see the watermark, indicating the legality of the tender. Of course you did not do this when you exchanged money. You trusted the fact that you were in the airport. Next time you’ll be more careful. So with your local currency in hand, you hop into one of the ‘legal’ taxis outside the terminal building. The driver is friendly and asks if this is your first time in the country. You say YES. WRONG! You have just given a potentially unscrupulous person enough information to start the ‘welcome to my country-Scam’. If it’s your first time, then chances are you don’t know the most direct –and cheapest fare—to your hotel. The taxi driver knows the most circuitous way to get to the hotel and, explaining that there is a traffic jam up ahead, he takes the detour. The usual 20 minute ride has been extended to nearly one hour, with a fare to match. Next, the driver asks why you are staying at the particular hotel you asked to be driven to. He then explains all the problems and complaints from his customers about this hotel, and lets know that he knows of a much better one that he will take you to, which will also save you money. Avoid this trick. If this ruse does not work, the driver may talk about a jewellery store or an art store or a souvenir shop that his brother owns, where you can get a great deal because you are the driver’s client, and ‘we can go there on the way to the hotel”. Don’t fall for it. You will never leave the store until you pay through the nose for cheap goods that can be found anywhere in the country. You finally get to your hotel and the driver pulls up just a few years away from the front door so the bell boy can’t really see you. The driver points to the meter—which in your jet lagged state, and the fact that you are unfamiliar with the currency, is quickly translated to you as $25.00 plus tip. You pay the man and bid him farewell. As soon as you leave the taxi you start to think and realize that the fare was actually equivalent to $2.50—not $25.00. You mis-read the decimal point—and on top of that you tipped the guy! Of course the bell boy did not see a thing so no report can be made to the tourist authority. Groggily and upset you check into your chosen hotel. Head upstairs and collapse on the bed. A few moments later the telephone rings. “This is the front desk, Sir. I’m sorry to disturb you but your credit card did not process properly so we need to double-check the details again. I know you’re tired so if you’d like, you can read it to me over the phone, or I can send someone up to record the card details”. In your jet-lagged state you grab your wallet and read out the card number, the proper spelling of your name, the expiry date and the security code. The man on the phone thanks you. Several minutes later, unbeknownst to you, someone has just charged the first of many expensive purchases on your card. You see the person that called you had nothing to do with the hotel, other than the fact that he was in the hotel watching as you checked in, getting in the elevator and watching which room you entered. He looked like a regular client of the hotel so you thought nothing of it. The man then went downstairs and used the house phone to call your room and get your credit card information. He now has a nice flat screen T.V., courtesy of you and your jet lag. To clear your mind you decide to go for a walk. You ask the hotel concierge directions to a local tourist attraction. He provides the information and then you set off to explore. The concierge was so nice by giving you a map of the ‘short cut’ to the attraction, to save time and see an interesting neighbourhood along the way. As soon as you leave, the cell phones are in action. The concierge calls an associate, describes what you are wearing and roughly when you will be passing by a certain place along the ‘short cut’ route. Once you arrive, a man or woman will pick your pocket or grab your camera or pass by on a motorcycle or bicycle and grab whatever they can. Welcome to our Country! I could go on with meal scams, fake police routines, bar scams, ATM kidnappings and more, but I think you get the idea. But you know the information in this article is not meant to dissuade you from travel. On the contrary it is presented to ensure that you are aware of the kinds of things that can happen when you are not paying attention or you are not being vigilant of your personal safety or that of your property. Every scam could be avoided by having your wits about you and by doing some research before you leave for your holiday. You could have checked the local currency, depicted on a website. You could have read the government advisories about the country and the most popular scams being enacted. You could have checked consumer sites (e.g. Lonely Planet Postcards) also to check on the ‘scam scene’. You can get into the habit of writing down a taxi driver’s number or even taking a photo of the taxi in which you are about to ride (hey, I’m a silly tourist that takes photos of everything); you can check in guide books for the most direct driving route from the airport to downtown, as well as the approximate fare and time to travel. You can know that hotels may request that you return to the front desk if in fact there is a problem with a credit card, but that they would rarely ask for the information over the phone or send someone to you room. But you can never cross every “t” and dot every “i” and that’s why scam artists are so successful. This is their professional career and they are good at it, practice it daily, take professional development tips from their co-workers and strive to enhance their weekly take home pay. Can you avoid being ‘bumped” as in the first scenario described? Probably not. But you may be able to avoid the classic ‘let’s surround and intimidate the tourist until s/he pays” routine. Sometimes a tourist is able to find one person in the crowd who speaks their language, appeal to that person with the truth about what really happened in the store or on the street, and have that person become the champion of their cause and allow them to leave with only a minimal payment or no payment for the alleged damage. Now that you are forewarned for the next time you travel (which I hope will be very soon) you can also be forearmed by doing some basic research and then being aware of everything going on around you. You don’t have to be paranoid—just pay attention. For starters, leave your wads of cash in the hotel safe, remove your bling from your neck and wrist and fingers, be discreet about paying for things, and don’t accept food or drink from strangers. Do enjoy the country and the people and the food and attractions. This way you can take home memories and photos, instead of a dent in your wallet, your confidence and your willingness to explore again. And me? I’ve explored 68 countries and over 540 destinations. I can hardly wait for the next opportunity. And yes, I have been scammed a few times.